Meet Hong the Swan Goose, the official mascot for Beidaihe National Wetland Park in Quinhuangdo, China. 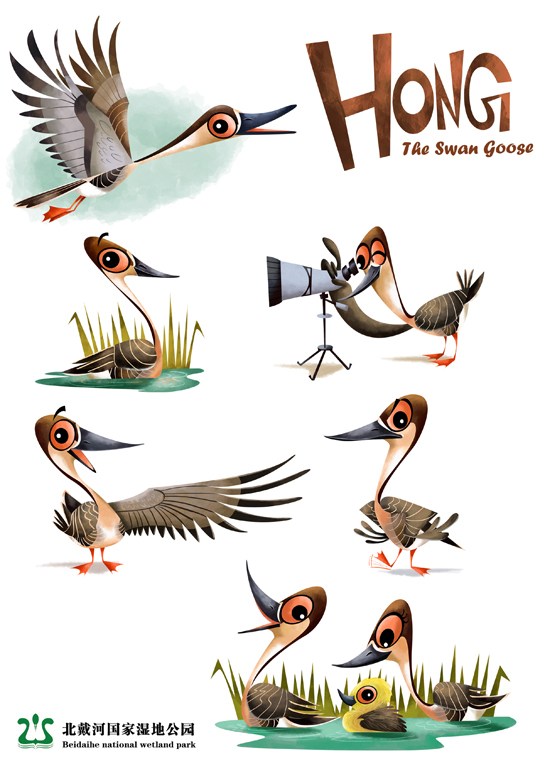 The Swan Goose, threatened by hunting, habitat loss and hybridization, was chosen as the official mascot to bring attention to its 'Vulnerable' status on the IUCN red list, and to popularize the bird and the park among birders and wildlife enthusiasts in China. (Some preliminary character designs before we zeroed in on the one in the centre). Thanks to the park management at Beidaihe for commissioning me for the project, and to my friend Yuli Yang of CNN Hong Kong, for helping me come up with a name for the mascot!